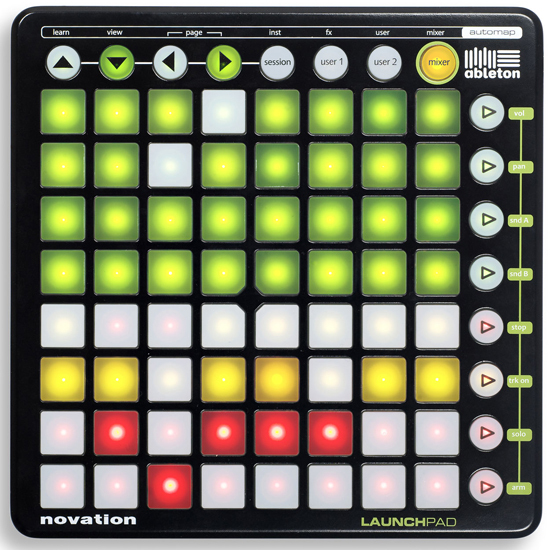 I started with what I already had, a Launchpad from Novation. In the aspect of diversity and portability, this controller presents many advantages. You have 64 + 16 buttons (8×8)+(2×8) located at a fairly small space, and you can flip through pages which multiplies your number of buttons endlessly. You also get visual feedback from the buttons in three different colors and four different brightness levels per color. It gets all it’s power from the USB-port and is easy to map to basic functions in Ableton Live with two-way communication. If you are in a hurry, the buttons are to small to hit with a drum stick. And the concept of having to take your hand away from playing isn’t appealing to me and to make it control more advanced functions, I had to make a m4l-patch for it, more on this in a later post.